I've joined a number of book clubs in my life, and let me tell you, each one has its own special flavor. That's the great thing about book clubs -- each group's special interests make for a totally unique experience. That got me thinking. If each book club is different, then why is there only one set of discussion questions at the end of most books? Wouldn't different types of book clubs want to talk about different things? I think so! With that in mind, I created three sets of reading guide questions, one for chatty wine drinkers, one for history buffs and one for regular readers. Each set of questions also comes with a fun activity and snack suggestion. 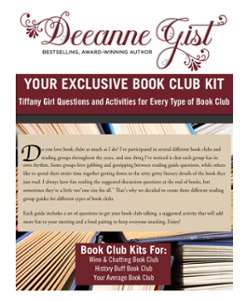 Just enter your information in the form on this page to download the perfect book club kit for you! Happy reading!